Hungarians just love to go to markets. Even if they don’t do any shopping, at least they have lunch at the bar of their favourite diner and share the recent news and gossip. But for my generation, a usual market kitchen is not very inviting. We associate them with heavy, spicy meals, the smell of oil that’s been reused several times, and cheap quality. However, three young guys, the founders of Eldoradó restaurant, believed that it is possible to renew this tradition of Budapest. In the catering corner of the Rákóczi vásárcsarnok (market hall) they have installed an open kitchen in the old-fashioned interior, and they have boosted the offer of the Hungarian retro buffets. The menu contains the newest ingredients of the gourmet world, but one can also find the traditional meals of the good old days with reliable quality. The prices at the same time are just a tiny bit higher, but this means a huge difference when it comes to flavours. 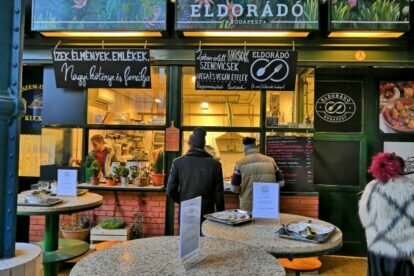 Since I found Eldorádó, I have joined happily the society of the market halls, eating in hat and coat at a high table while checking the prices of the veggies next to me. After entering the right entrance of the hall, find it on your right side.